Our outpatient clinic in Marksville, Louisiana, Lemoine Therapy Services, recently participated in our company-wide Looking Forward, Giving Back campaign. Therapy Center started this campaign; inspiring our teams across the state in giving back to the many communities we serve. As a part of this effort, Lemoine Therapy Services partnered with the Food Bank of Central Louisiana to fight a rising challenge in Louisiana food insecurity. Louisiana has one of the highest levels of food insecurity with increasing numbers of clients visiting emergency food program sites, according to the Food Bank of Central Louisiana. Research directly links family food hardships to health; learning; and behavioral outcomes in children. 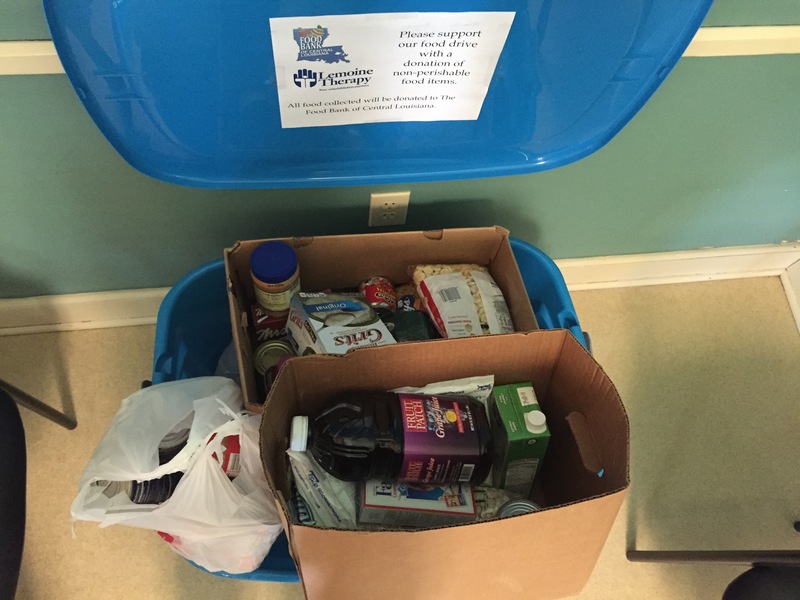 Lemoine Therapy became an official drop site for the Food Bank of Central Louisiana in May 2015. As a result of their month-long drive, they collected nearly 110 pounds of non-perishable items which were dropped off to the Food Bank in Alexandria, Louisiana. “We loved the food drive! We really enjoyed working with our patients for the greater good of our community. It made us close as a team, and even closer to our patients and their families,” says Diana Booty, office manager at Lemoine Therapy. “I strongly encourage everyone to participate in a giving back project in their community. It helps the team the team you work with come together as well as the patients you work with,” says Peyton Splane, physical therapist assistant at Lemoine Therapy. To read more stories on giving back projects our company has participated in, please visit our blog.